B|E Retrofit was founded by father-and-son team Ed and Kevin Colwell in 2010, although much of the Company’s fundamental principals were established much earlier. It’s from our family roots that our core values were born: Exceptional Service, Get Your Hands Dirty, Team and Respect for People and Property. When we started B|E Retrofit, it was just the two of us, a set of tools, a truck and a passion to understand every component of weatherization and do it better than any other firm. This included crawling through 110°F attics, re-thinking our operations system, and improving typical industry practices. Over time, B|E Retrofit has become the leading provider of building envelope design and installation services in commercial and institutional buildings for ESCOs, Design-Build Engineers and Contractors in New England, New York and the Mid-Atlantic. Our recent work includes projects at Brown University in Rhode Island, the Town of Farmington in Connecticut, the Red Clay Consolidated School District in Delaware and the Town of Scituate in Massachusetts. We work with leading ESCOs and Design-Build Engineers including Ameresco, GreenerU, Guardian Energy Management Solutions, NORESCO and Trane. See our Case Studies for more project information. We view every project as an important opportunity to prove ourselves, strengthen our partnerships and continue to build a successful organization. 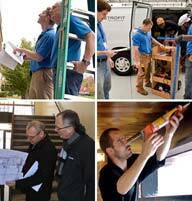 We look forward to the opportunity to prove ourselves to you on your next weatherization project. You can see that Ed and Kevin love what they do. Whether they are producing reports or working on an installation, they do everything well.